HMH Books for Young Readers, 9780544358638, 48pp. The neighborhood block party is today. Jada and Jamal Perkins are super excited. Their best friends, Carlita Garcia and Josh Cornell, are on their way over. Mr. Perkins promised them a BIG surprise. The surprise is thumping and bumping its way around the Perkinses’ backyard. What could it be? 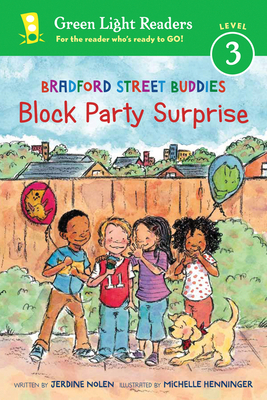 And how will the Bradford Street Buddies get a surprise that BIG to the block party? "Full-color, detailed watercollor illustrations show a welcome cast of ethnically diverse characters. This new offering is tailor-made for children who are ready for books they can read independently with confidence." "Ink-and-watercolor illustrations provide helpful visual cues while capturing the autumnal atmosphere and the distinct facial expressions of the multicultural cast...This approachable story will be rewarding for kids just getting into independent reading."